SAN FRANCISCO – June 21, 2018 – Following the move one year ago to the Linux Foundation, the Data Plane Development Kit (DPDK) project today announced the availability of its milestone DPDK 18.05 ‘Venky’ software release, named after Venky Venkatesan, who was known as “the father of DPDK”. The DPDK project’s 5th major release since joining the Linux Foundation accelerates packet processing workloads running on a wide variety of CPU architectures (including x86, ARM and Power) and supports many enhancements for Encryption, Compression and Packet processing. Network performance, throughput, and latency are increasingly important for a whole range of applications and implementations such as 5G, Cloud, Network Functions Virtualization (NFV), wireless core and access, wireline infrastructure, routers, load balancers, firewalls, video streaming, VoIP, SD-WAN, vCPE and more as the ways in which the world communicates rely more and more on fast and stable networks. By enabling very fast packet processing, DPDK makes it possible for organizations to move performance-sensitive applications – like the backbone for mobile networks and voice – to the Cloud and help create higher performing edge devices. A true community effort, DPDK 18.05 ‘Venky’ release was built with contributions from over 160 developers, and over 1700 commits across more than 25 organizations. Since mid-2017 when DPDK joined The Linux Foundation, the project has issued five major new releases, hosted five community summits, and established a lab to perform automated performance testing of new patches. Another exciting development in DPDK is the ability to run on Microsoft Windows. This is available in a draft repository (http://dpdk.org/browse/draft/dpdk-draft-windows/) and will be merged into the main repository in future releases. This expansion in OS support will help to enable new use cases for DPDK. 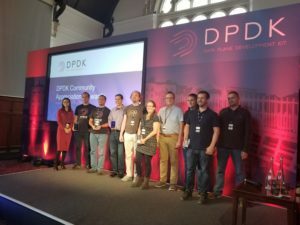 The DPDK and FD.io communities recently lost a key founding member of the communities: Venky Venkatesan, known as “the father of DPDK,” passed away following a long illness. The DPDK community expresses its utmost condolences to Venky’s family, friends, and extended community. As a token of appreciation, the DPDK 18.05 release has been re-named in Venky’s honor. Venky was an incredibly inspiring man who exuded greatness all around; he will be dearly missed. DPDK is comprised of a robust community of member organizations committed to enabling accessible fast packet processing to help move the networking industry forward. This includes Gold members Arm, AT&T, Cavium, Ericsson, F5, Intel, Mellanox, NXP, Red Hat, ZTE; Silver members 6Wind, Broadcom, Huawei, Spirent; and Associate members Eötvös Loránd University, KAIST, Tsinghua University, University of Massachusetts Lowell, and University of Limerick. For more information or details on how to participate in the DPDK Project, please visit: www.dpdk.org. “F5 is pleased to see yet another strong delivery by the DPDK.org community. The 18.05 Venky release contains vital enhancements for hardware acceleration which broadens the value proposition for end customers, making this open community even more attractive and valuable to all ecosystem players,” said Dave Schmitt, Chief Architect, F5 Networks. The Data Plane Development Kit (DPDK) project consists of libraries and drivers to accelerate packet processing workloads running on a wide variety of CPU architectures. By enabling very fast packet processing, DPDK makes it possible for organizations to move performance-sensitive applications to the cloud. Created in 2010 by Intel and made available under a permissive open source license, the open source community was established at DPDK.org in 2013 by 6WIND and moved under the auspices of The Linux Foundation in 2017. The Linux Foundation has registered trademarks and uses trademarks, including The Linux Foundation. For a full list of trademarks of The Linux Foundation, please see our trademark usage page: https://www.linuxfoundation.org/trademark-usage. Linux is a registered trademark of Linus Torvalds.